For a holiday with a difference, why not travel by rail? It's both the Journey, and the Destination! One of the best ways to truly see North America is from the the broad windows of a passenger rail car. Recline in your seat or private accommodation, or even admire an all-encompassing view from a dome car. Relax and enjoy your trip. Stretch your legs. Move around, do what you want at your own pace. Play a card game. Read a book. Chat with your fellow travellers-share stories. 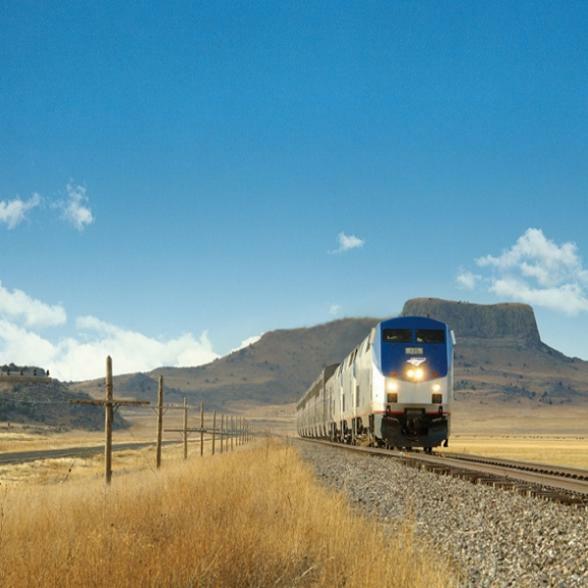 Learn more about your route from your friendly Amtrak staff. You will enjoy scenes of America not accessible by any other means of transportation. Travel in comfort and experience the kind of romance only a train journey can offer! Take in American life in busy and remote regions of the USA. See children waving from front porches, moose drinking from pristine mountain streams, surfers along the Pacific Coast, cattle grazing under an open sky, picnics and baseball in the mid-west. Church steeples and flags greet you on the Atlantic shore between Philadelphia and Boston. In the West, California's Napa Valley and orchards beckon you. Authentic America - its cities, its forests, and its people - is waiting for you. To see our suggested holidays by rail please CLICK HERE.